A very exciting week for us here at Philly Sketchfest. We have our February showcase taking place this Friday, February 19th with sketch from Spirit Animal & The Flat Earth and stand-up from Alyssa Al-Dookhi at 8:30pm and then at 10:00pm it’s a brand new set of sketch from The Prince entitled, ‘Whole Human, Whole Horse’ directed by Maggy Keegan with stand-up from Joe Bell! 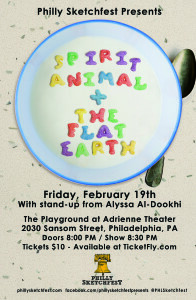 Philly Sketchfest is proud to host the two sketch groups who represented Philadelphia at this year’s Chicago Sketchfest, Spirit Animal & The Flat Earth. They’ll be performing their sets, in full from Chicago for this one-night only event! The entire block of comedy will be hosted by stand-up comedian, Alyssa Al-Dookhi who will also perfrom! Follow Alyssa on twitter @TheDookness and her website – thedookness.tumblr.com. Spirit Animal is the quirky, reference-filled sketch comedy duo of Shannon DeVido & Kristin Finger! The Flat Earth is a Philly Improv Theater (PHIT) Sketch House Team formed in 2012. They have been accepted into and performed at the Chicago Sketch Comedy Festival (2015 & 2016), San Francisco Sketchfest (2015), and Toronto Sketchfest (2015 & 2016). The Flat Earth is Jacquie Baker, Vincent P. DiCostanzo, Rich Lee, Matthew Schmid, Molly Silverman, and Adam Siry. They are directed by Paul Triggiani (Secret Pants). 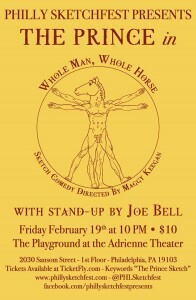 Philly Sketchfest is equally proud to host, The Prince for a full-length show entitled, ‘Whole Man Whole Horse’ directed by Maggy Keegan! Comedian, Joe Bell will be hosting the show and performing stand-up! The Prince is a sketch comedy duo featuring Frank Farrell and Jamie Glasheen. They were accepted into and performed at the 2014 Philly Sketchfest and have also performed at ‘Hey, We’re Cool‘ at L’etage, Philly Improv Theater (PHIT), and Good Good Comedy.